Club Penguin Cheats by Mimo777 Club Penguin Cheats by Mimo777: Is Billybob the Director? The Director has hidden a message in the new Club Penguin Times! On the second page of the Featured article, hover your mouse over "extreme peak face-off." Oh great! What's Herbert up to now? THIS WEEK? Yikes, we better be on alert! But wait! The last line says, "Be resourceful. Be remarkable. Be ready." Does that sound familiar? It sure does! That is the same thing Lane, AKA Billybob says at the end of the "Behind the Scenes" video! That would be so cool! What do you think? Umm... Yeah.. I don't think so. The whole video was EPF themed- it looks all "secret agent-y" so it's likely he did that to match the look of it. I am gonna post this on my site and give a link to this post.Thanks. Mimo, Aunt Arctic is the director, and the director always says Be Resourceful, be remarkable, be ready. Aunt Arctics glasses turn shady when you hover over them in the newspaper, old HQ music was morse code saying Aunt Arctic is the head of the PSA, and the way he signs his letters in our code is the letter after Z- which in portugese is AA. And portugese is the first language they added to Club Penguin. AA=Aunt Arctic. just saying...but if you play the clubpenguin ds games then you sould know thats the directors way of ending a meeting. plus the director also uses that a few times in normal missions in clubpenguin. but great thinking, i like your style. Hes not the director. well he is he programmed him. But the Site Identidy is Aunt artic. Mimo, I noticed a bug when your trying to save your password on the home page login.It says "Yes" or "No"
The letters are the wrong way round. Mimo that is the PSA's/EPF's motto. Billybob said it becouse he was pretending to be an agent. The director has always said that. Director could be tricking us. He wants us to THINK he's AA! If Billybob is Director, that would be wicked awesome!!! Its the Director again. I told you. 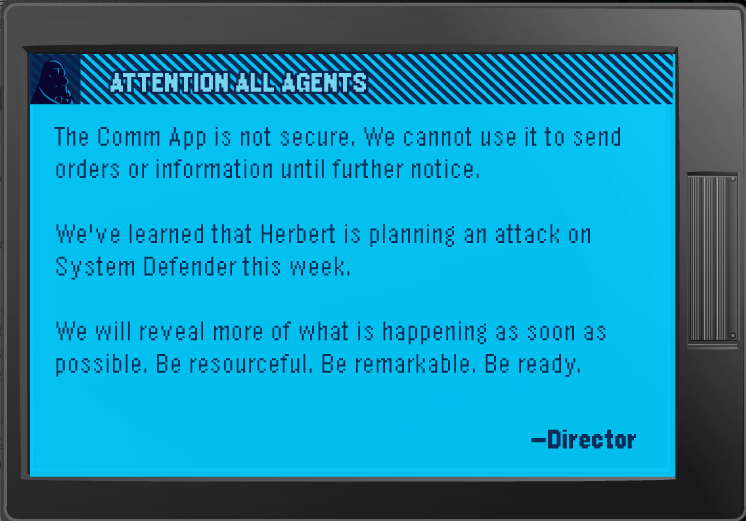 That is why the EPF hidden that message. We have no idea what Herbert is up to. Stay sharp agents. Aunt Arctic is the director the director always says be resourceful, be remarkable, be ready so it is not a suprise the director would say that. p.s. The director is wearing glasses but not ANY glasses like aunt artics ! No Mimo! The Director has been saying that for years! The reason Billybob said that was because he was acting like The Director! I'm pretty sure Aunt Arctic is the director. I've seen that line used here and there, and it's used by the 'official' penguins (such as Aunt Arctic, Billybob, etc). So, really, it's used by multiple penguins. I bet it's too keep the 'Director' anonymous. just saying thanks for code to cooldude113. im a non member and this is first shirt.